“Sons of the West. Red, white and blue …..” The words of the victorious team’s song ring out across the MCG. It’s a hollow feeling for the vanquished losers, though it’s hard not to feel some genuine happiness and joy for the Bulldogs’ players and supporters. I do. But we are the defeated. As our players are required to do, I wait, high up in the Southern Stand till the medals and Cup are presented to the Doggies. Respect is due to the victors. I congratulate the Doggies fans around me and depart. It’s an empty feeling as I head across Treasury Gardens to the City. Another season gone. So close to the ultimate success. Over a beer at the Imperial and dinner at an Indian place down Bourke Street, my non-Swans mates tell me it was a great game. I guess so, however it’s hard to have perspective. It’s still raw. It hurts. I am proud of our Blood Brothers though. They gave their all ….. their best shot. The Dogs were the better team though with a greater contribution from all 22 players than we were able to garner. We had our chances, early in the first and later in the second quarters to establish a break. It was not to be. From midway in the third they had the better of us. We clung on, however the band snapped with about five minutes left. They had what we lacked – speed, good hands and efficiency of ball use through the middle…. transition from defence to offence. And perhaps they had just that bit more desire, after such a long wait for success. Though I can’t fault our effort. In particular, Joey Kennedy was sensational. When has he ever not delivered in a big game? Reg Grundy and Dane Rampe simply superb and impassable in defence. Many others did their bit. Buddy tried hard and kicked beautifully. Heeney was very good. Maybe some of our boys were a bit banged up from previous games, or from knocks on the day. We missed Aliir’s run from defence. It takes a lot to go right to triumph on the big day. It’s hard to make a Grand Final and hard to win one. No excuses though and to be fair the Dogs missed key players over the course of the year, also had injured players and rose to the occasion. Well done to them. I am writing this piece in the bar of the Rising Sun in South Melbourne over coffee and lunch. I’ve just done the walking circuit of Albert Park Lake. I had hoped to be over this way yesterday to celebrate a success. I like the idea of tradition and ritual, like attending the Footy Almanac GF Eve Lunch, and having brunch and dinner with the same mates on Grand Final day for over 20 years now. So I think I’ll make a habit of coming over here to farewell the season from now on. It’s my spiritual homeland from years of attending South games at the Lake Oval. It’s where my Dad grew up. So what to make of 2016 for the Swans. Many more wins than losses. Some memorable wins, some heartbreakingly close defeats. Breakout seasons from a number of players. Some exciting young talent blooded into the team. Finals wins, a Grand Final. And Buddy. How could you not enjoy watching this bloke play for your team. A champ. For me some away trips to Sydney and Hobart .. old friends and new. An enjoyable season, despite not delivering the ultimate success. With the season done, I’ll have more time for reading, writing, walking, golfing and perhaps some Vets cricket this season. It’s an exciting part of the year for all footy followers. Your trades and draft selections are all expected to deliver an improved team. And long term injured players are predicted to return better than ever. Perhaps Sam Reid and Alex Johnson for the Swans? I might also have time to go on the quest for the lost free kicks. That would be fruitless though. Because we know that the rules that they change or focus on at the start of the year will be long forgotten come finals time. Taking players legs below the knee, the protected zone are two gone missing, as well as the traditional in the back and holding the ball … gone missing. I think all supporters just want consistency in interpretation from the start of the year till the end and for all teams. It would be remiss of me not to mention Ted Richards and thank him for an outstanding career at the Swans. He leaves as a Premiership player and All Australian. Well done Ted. A true Blood Brother! Keiran is a lifelong Swans supporter, despite a brief dalliance with the Cats and Tigers in primary school years. 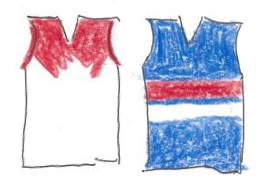 Family connections to Port Melbourne and South Melbourne demanded loyalty to the Swans. The long wait for success was worth it. Twas good to out a face to a name on Friday. Thanks for taking the time to come over and say gday. A good piece again, although I found it quite difficult to absorb emotionally…..my way of coping is to turn off all communication re the result for a while. An adolescent response probably, but that’s just how I roll. I’ve never stayed for the Cup presentation when we have lost. This time despite an inclination to do so I was dragged out by my boy and a mate. I get the “respect for the winners” thing…and I would have found it easier this year than in a loss to Hawthorn….but it remains a line that I find hard to cross. The day of reckoning for some of or rookies arrived and (understandably) it was just a bit too much for them. Lovely work, Kieran. Magnanimous in defeat, as I knew you would be. Commiserations to you and apologies if you spot me going past your place on one of my walks with a beaming smile on my face! Tough crowd, Keiran. Your Swans were gallant and I’m sure they’ll bounce back hard in 2017. Good on you for staying on for the presentation. Having seen 7 losing GF’s and 2 draws, I know that couldn’t have been easy. Gigs, I reckon you can sing, dance and do cartwheels for at least the next 6 months. Phil, not as bad as losing to the Hawks … A very painful experience! Craig & Chris, yes at least 3 or 4 players below par and the rookies not up to contributing for the full four quarters. Can’t win a big one with that type of performance. I’ve forced myself to watch the game again. I don’t think we played a good game. Lack of movement through the middle. I think we need some more pace and elite ball users. Hard to know how to react. Gutted but still happy for Dogs fans! Kieran, well done on putting some excellently written words together after a GF loss. As you mention, some good players to come back, and another pre season for some of your fantastic young players will see the Swans challenging again. What a game by J.Kennedy. Clearly BOG at 3/4 time, I had him 3rd best at the final siren. Hope you get to play some Vets cricket!